New York State passed what one legislator described as “the toughest gun law in the nation” and the NRA called “draconian”. It’s the first new gun law since the Newtown massacre. 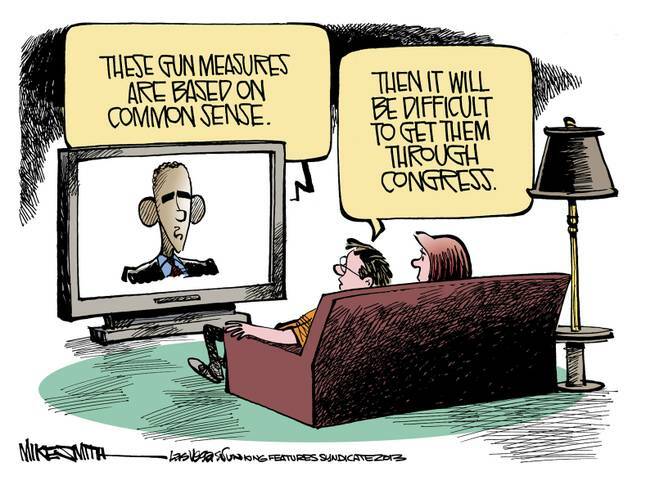 Meanwhile, President Obama laid out his plan to reduce gun violence. I saw a lot of commenters use the adjective “bold” to describe Obama’s proposals, but I think that just underlines how frozen the gun-control conversation has been. Limiting magazine size and restoring the ban on assault weapons are popular measures that seem like the least we can do. The rest of his 23 “executive actions” include steps that are surprising only in that they hadn’t been done a long time ago: appointing a permanent ATF director, allowing the CDC to study the public health effects of guns, and so on. Obama’s actions were commonly misreported as “23 executive orders“. (Actually only three of the actions were orders.) It will be interesting to see whether the panic about the “orders” will continue now that the full blandness of the orders is apparent. Here, for example, a Christian talkradio host and a pro-gun advocate go on at length about possible reactions (rebellion? local refusal to enforce? impeachment?) to an anticipated executive order confiscating guns. The striking thing about this conversation is that it was based on exactly nothing. Obama’s executive orders hadn’t even been written yet, and neither man claimed to have a source inside the White House. BTW, if you’ve been wondering who needs semi-automatic weapons with 100-round magazines, the answer is obvious: people who are preparing for an apocalypse. There are more of them than you think. When you have to defend your cans of Himalayan salt from the ravening hordes, you’ll need that kind of firepower. And if you want to plunge deeply into the conspiracy-theory world, google “false flag operation”. A false flag operation is when disguised agents stage an event, so that the organization they really represent can react against it. As in the Reichstag Fire. There are false-flag conspiracy theories about both the Newtown and Aurora massacres, contending that the government staged the events to create an excuse for confiscating guns. Can you believe it’s just now Inauguration Day? Wasn’t the election like a decade ago? Both liberals and conservatives see a change in President Obama since the first inauguration. He came into the presidency trying to work with Republicans as if they were reasonable people who wanted to solve America’s problems. That was naive. The iconic example is the stimulus. Obama took office amid a global crash that had even conservative economists calling for a stimulus. Liberals and conservatives mainly disagreed on the size of the stimulus and whether it should be mostly tax cuts or mostly new spending. (“A stimulus is needed without further delay,” Mitt Romney wrote in December 2008, advising Republicans to insist “that tax cuts are part of the solution”.) So Obama proposed a smaller stimulus than liberals wanted and made it 1/3 tax cuts, thinking this was a nice split-the-difference bill that a large majority could get behind. This netted him zero Republican votes in the House and demonization of his “socialist” plan. Or health care: Rather than the single-payer model liberals favor, Obama based his plan on Romney’s Massachusetts plan (which in turn had been based on work by the conservative Heritage Foundation). Along the way, he dropped the public option and tweaked the plan in a variety of other ways to answer Republican criticism. Result: unanimous Republican opposition. Again and again, Republicans turned against their own ideas as soon as Obama got on board. John McCain opposed the McCain-Lieberman cap-and-trade plan. When Obama offered John Boehner a deficit-reduction plan structured according to Republican proposals, Boehner walked out. It went on and on. By the fall campaign Obama clearly realized this had gone far enough. He called Republicans out on their extreme anti-woman and anti-Hispanic positions, as well as their math-challenged tax proposals. Since the election, he has driven a hard bargain on the fiscal cliff and offered nothing in exchange for raising the debt ceiling. (He won.) His common-sense gun-control proposal puts Republicans on the spot: Do they side with the American people or with the NRA? Next, a big, big shout-out to my opponents on the right — I really couldn’t have done it without you. … Every time I needed to paint the American right as paranoid and out-of-touch, misogynistic and mindless, you were there for me. Thanks for making Sandra Fluke a martyr, Rush. Thanks for Glenn Beck and Sean Hannity, Mr. Ailes. Thanks for everything, Donald Trump. Todd Akin — I love you, man. Obama must be tempted by a shiny political object: the destruction of the congressional GOP. He knows that Republicans are forced by the momentum of their ideology to take positions on spending that he can easily demagogue. He is in a good position to humiliate them again — to expose their internal divisions and unpopular policy views. That’s not how it’s going to go. If congressional Republicans can’t control themselves, second-term Obama is going to place a 911 call to the voters and have them taken away. How Do You Know What You Know? looks at two recent books: Nate Silver’s The Signal and the Noise and Bill Kovach and Tom Rosenstiel’s Blur. Each looks at how to deal with information overload, and Silver raises an interesting parallel between the internet revolution and the printing-press revolution: Both led to polarization. The reason is expressed in this week’s quote. If you’re not watching The Abolitionists, you’re missing out. Part III airs tomorrow, but you can catch up by watching I and II on the PBS web site. Even if you think you know this history, it’s stunning to see the interweaving threads of the full tapestry. If a Whole Foods employee were doing this much damage to the brand, John Mackey would fire him. I’m developing an affection for the League of Ordinary Gentlemen blog. Their Guns in America symposium is both diverse and rational. If all the positions you are hearing are extreme, read a few articles here. Glenn Beck is designing his utopia. Laugh if you want, but there’s a more interesting way to look at it: A certain kind of communitarianism has cross-partisan appeal. Like many liberal visions, Beck’s “Independence, USA” has small locally-owned shops rather than WalMart, and walkable streets rather than superhighways and parking decks. It grows its own food instead of trucking it in from big agribusinesses. I’m not sure how Beck imagines maintaining this urban plan without the heavy hand of a central bureaucracy, but let it go; utopias are like that. « How do you know what you know? So, a hundred years ago neighborhoods were full of corner shops on walkable streets, without any government regulations to force them to be that way. What changed? Part of it was that cars were, for a long time, the future and everyone’s aspiration. This precipitated massive government subsidies for road-building. Part of it, it turns out, was redlining, often based on maps handed down from the FDR administration’s FHA. Part of it is legitimate regulations which nevertheless harm small businesses and discourage local development. Part of it was wholesale destruction during the era of urban renewal, followed by a pushback that has made urban development extremely difficult in many places. To this day, in the vast majority of American cities, real walkable urban development is illegal; where it’s not illegal, it’s strongly discouraged by parking minimums and other zoning requirements and also by bloated public processes, so that only faceless corporations are able to jump through all the hurdles. So, as much as it pains me to say this, Glenn Beck is more or less right in this instance.